Posted in News, Partnerships, under . Tagged with Laureate Education, OBHE, PPPs. 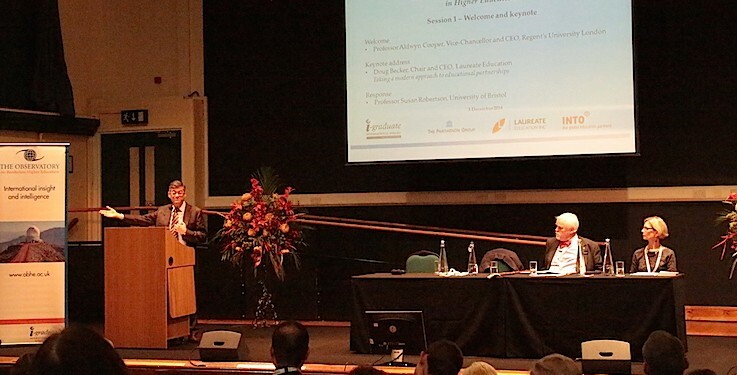 Doug Becker, CEO of Laureate Education, told delegates at a public-private partnership event in London this month that his company’s mission was to increase access and focused on the “transformational impact” of education. Ethical issues around transnational delivery of education in a public-private partnership (PPP) – such as academic censorship or gender segregation of classes – was a debate that “someone else can take on, but not us” he said. “It’s not that we don’t pay attention to the debate, but we consider what is the greater good that we can create [in terms of access to education],” he added, underlining that when the company partners in another country, “This is their environment”. Becker impressed the audience of senior HE figures and many established pathway operators, for example, when relaying Laureate’s success in delivery of global education opportunities. Laureate has been the largest recipient of Saudi Arabia’s Colleges of Excellence funding programme, operating four of the first 10 colleges opened. “And in terms of academic results, we are 1-4 in terms of academic outcomes,” Becker added. Overall, Laureate Education teaches, online and offline, 950,000 undergraduate and graduate students in 29 countries with a turnover of US$5 billion. It operates as a TNE partner or its own stand-alone fully owned operation, via the Laureate International Universities brand. Becker cited examples of Laureate working with a public sector partner, such as enabling Monash University to open a campus in South Africa. Looking toward the future, Becker predicted far greater PPPs as education provision becomes more competitive. Up to a third of revenue in the US HE system could disappear, he suggested, because of loan sourcing and other factors. “A lot of institutions will not be able to survive,” he warned. Becker said the three factors linked to Laureate’s success were a combination of achieving local assimilation and leading quality attainment relevant to that market; a commitment to being accountable for student outcomes; and having a deep connection with employers. And, he noted, the company understood how to work with university partners, whose “brand, reputation and accreditation/regulation are core to their survival”. Summing up an observation commonly voiced during the event, The Future of Public-Private Partnerships in Higher Education, Becker said increasingly there is a blurring of public and private remits. “In many cases, public institutions have a high degree of institutional autonomy and are really ‘private’ in many aspects of getting things done,” he said. Other discussions during the OBHE-organised event focused on different elements of PPPs including working together toward a social good. Professor Pamela Gillies of Glasgow Caledonian University described the complete cultural shift at a university that had student mobility rates of only 1% when GCU first partnered with INTO in Scotland. Now with other campuses in London and New York, students and staff are far more globally engaged, explained Gillies, and she related that with Chancellor Muhammad Yunus at the helm, the university has been able to develop projects overseas including in Bangladesh, where the Grameen Caledonian College of Nursing was established. Karan Khemka from consultancy firm The Parthenon Group advised that the private sector will have to plug the gap as global demand for access to tertiary education inclines. Meanwhile, Roger King, a member of the Higher Education Commission and visiting professor at the University of Bath, raised interesting questions about further development of PPPs. He asked about financing of student loans (no consumer credit link), the financing of expansion plans for universities that had a charitable status (did it offer enough scope) and risk-based accreditation (the right approach?). King also said that the digital revolution presented a huge opportunity for PPPs to work together in this “new emerging disruptive technology”, noting that online learning systems and the analytics should not “become hidden by commercial and proprietorial pay walls”. “Up to a third of revenue in the US HE system could disappear” says CEO @LaureateIntlU: http://t.co/VnTnXxJWHA Will PPPs be the future?